I'm still on a safari kick. This Old Navy vest was a steal and it works with so many different outfits. I can easily wear it with a pair of jeans, a maxi dress, or with a romper. It's perfect for summer when all you need at night is a light layer. Love this look! the vest reminds me of how much i want a parka for fall/winter! Cute romper, and I've totally been wanting a vest like that! PS I'm hosting my first blog giveaway this week for a gift card for an online shopping spree from Zestii, and I would love if you stopped by to enter! All you have to do is leave a comment here! Love the most when you paired the casual stripes with the chuncky necklaces! Love the vest with the stripes.. I've been looking for vests myself. Great find!! I love that vest! I have a very similar jacket from H&M... really regretting not hitting up Old Navy while I was in San Francisco now! This made me smile Taylor, its so so cute! Don't think I've ever seen a more beautiful safari look, the necklace is so unexpected but such a genius idea, for a glam touch! Love the vest! So versatile and of course a great price point, I ordered it as soon as you posted it on Twitter! Come by and my Stiletto Hardware giveaway if you like! 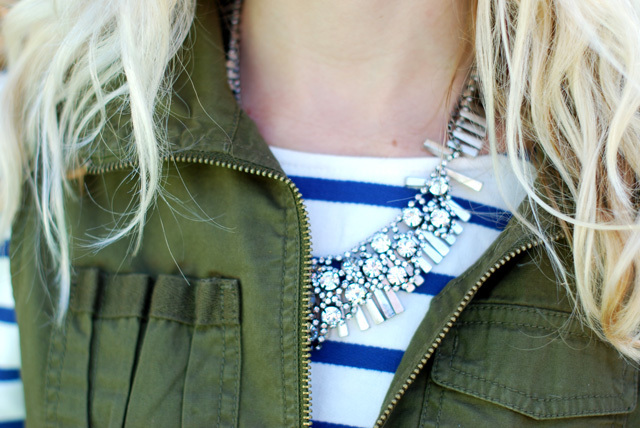 I love the combination here - the sparkly necklace with the vest & nautical stripes...perfect! Definitely safari chic! And that statement necklace is a beauty. That vest is so cool. Stripes are everywhere this season & I'm excited to see them even in romper form. very cute. Gah, I've had my eye on this vest! Our old navy didn't have it when I stopped in to check, but it might still arrive. It looks super cute, as does that romper! Adorable on you! I love this outfit!! You look Beautiful!! i loveee that vest, and it goes perf with the shoes! 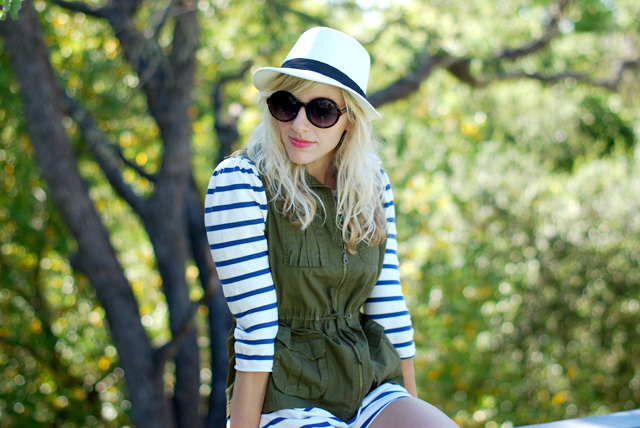 Breton stripes AND a romper?! Adorable. I love that vest! I've been thinking about getting one from ON! Does it run pretty true to size? I could see it running a little big! Love the look! and wedges! Love this outfit. That striped jumpsuit is amazing as is that J. Crew necklace! As soon as I return from vacation, I'm off to buy this vest! It's been on my list since you tweeted about this lucky find. Looks fantastic with the Hallelu romper! This romper is too cute!!! Cute! I just bought that same vest recently, looking forward to some weather less than 100 degrees so I can actually wear it! hitting up old navy today! thanks for sharing! I think that Old Navy is so fabulous when it comes to layering and mixing. Lovely! loving this outfit! so perfect for the summer! FGorgeous ouit! So simple and chic! Love the wedges! Awesome! I love this outfit! I love the vest! and the romper is so cute! This is SO the typical Taylor outfit. 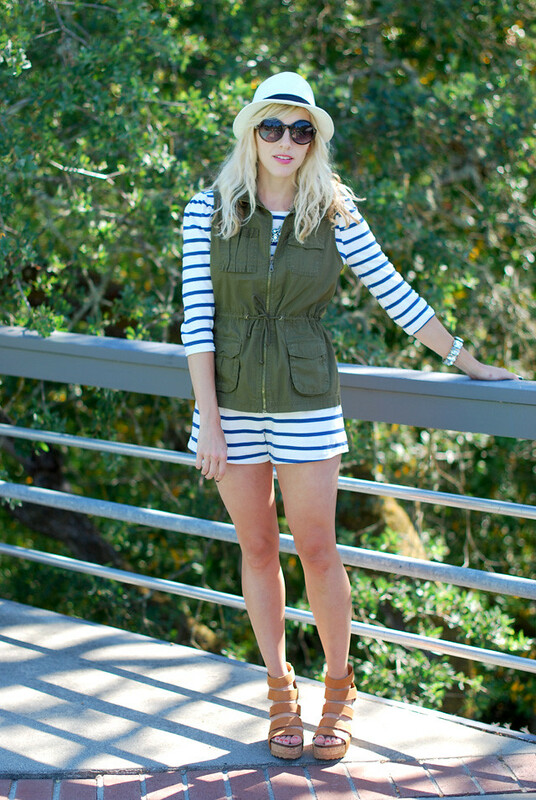 Stripes, sunnies, a gorgeous statement piece + a safari element. I'm obsessed with this look! 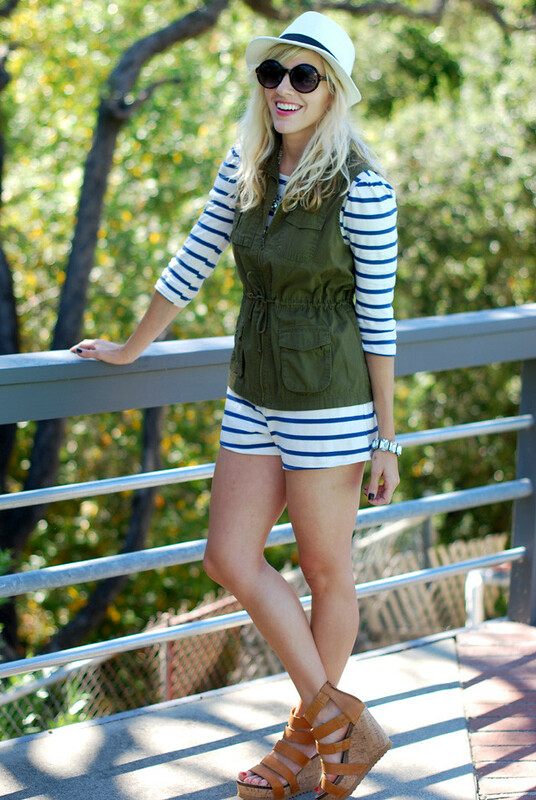 Safari meets Sailor :] Just pinned it to my pinterest "Style" board! I am in love with your necklace! I have been looking for a piece just like that!!!! I LOVE that romper! Too cute for words. I think this speaks for itself! That vest has to be up there with your BEST purchases as far as cost per wear....you are SO right- goes w SO many different looks...and is seasonless. Just picked up this vest yesterday! Love the way you styled it! just. so. cute. i love the stripes (natch,) and need the vest! great post.